Now a little embarrassing background information here. When we first moved to our house here in paradise, we had two bikes. Two cheap Wal Mart bikes, but two bikes nonetheless. I had grand visions of glorious bike rides through the neighborhood together, since we were leaving the wretchedly hot Arizona weather behind. One beautiful evening, we decided to take our first ride together. We could barely pedal up our own cul-de-sac. Seriously. It was not even that big of a hill, and we were dying. And we were in good shape back then. What the heck? We were no match for the hills in our neighborhood. We took to fast-walking instead, and donated our bikes to the next charity yard sale in my moms' club. Fast-forward seven years, and the man was at it again. He said we would love having bikes. 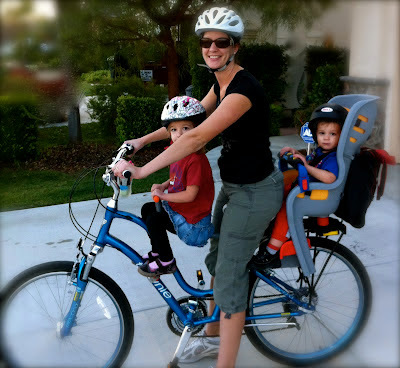 The kids all love their bikes, and it's a good, healthy family activity. Damn, he is good. I tactfully reminded him of our last bike venture and our epic fail at the hills. Oh, no problem he said. He had that all worked out. Last time we had cheap heavy bikes. This time, he had a solution. Electra bikes. They were specially made (in the U.S.A.) flat-foot technology (c'mon, that sounds made up, right?) road bikes that would make pedaling easier. He showed me the web site. AAACCKKKK!!! The price?! In-freakin-sane. No way! No how. I was not going to spend that money on an activity that we could all give up in a couple rides. We decided to "table the conversation" for another time. Once again "El Cheapo" vs. "El Gadget-lover" would discuss this possible purchase for quite some time. Coincidentally we went to visit my in-laws the following weekend, and my mother in law had just purchased a bike. It was very nice, and she sweetly offered for me to take it for a spin. I hopped on and started pedaling. Wheeeee...wind in my hair, bouncing up and down over little bumps in the road, eyes tearing up from going so fast, I had flashbacks of banana seats and handle-bar streamers from my childhood. Darn it, those two are good. They got me. They got me good. As I pulled in the garage, I knew El Cheapo was about to make a purchase. El Gadget-Lover happened to have a web site saved on the computer with very good pricing and free shipping on the bikes. Hmmm...what a coincidence. Because of the discounts, we were limited in the colors of the bikes, but we thought the options and quality of these bikes greatly out-weighed choosing particular finishes. A small victory for El Cheapo. So that Christmas, Santa brought us new bikes. My girls were so sweet. They could not believe that both of us had gotten a bike for each other. hee hee. I love my innocent babies. I am not too proud to admit it. My husband was right. Very VERY right. Bike riding has been awesome for our family. Now the logistics. We have three little kids. Our (then) six year old was a pro on her bike. Riding two-wheels for almost two years by then, she was very good and we knew she could keep up. Now, the options for the other two: trailer, training wheels, baby seat? I was opposed to a bike trailer for a few reasons. First, I have a double jogging stroller already. It is awesome, and very useful, and I love how it has enabled me to take all of the kids by myself wherever I need to go. But it's huge. I didn't want another huge trailer/jogger type thingy. Also, the point of riding a bike (to me) was the ability to feel that freedom, be able to ride wherever you want to go. I was afraid the bulkiness of the trailer would limit my trails, my turning capacity and just be too big. Also, our (then) 3 year old was really good on her training wheels, and I knew she'd outgrow the trailer very soon. She just couldn't quite keep up with us on the training wheels. It was excruciatingly slow for the rest of the family to try to slow down to her pace with the little bike with training wheels. Electra Townie bike with Tyke Toter up front and Topeak infant seat on back. Once again, I have to say, my husband was right. It is VERY fun to ride bikes with the kids. This set up works great for me. It really does make it feel more like I am just riding my own bike. It is very easy to maneuver, I can turn quickly and easily, ride on the sidewalk or street, and go and stop very quickly. The only time I have ever felt motion at all, is when my incredibly strong and active (now) 2 year old lurched to one side or the other purposely messing around. It was not even strong enough to tilt me off-course, or make the bike sway at all, I could just feel a little motion....kind of like if you were riding someone on the back of your bike and they leaned the opposite way you did as you were turning. I will say, that my daughter was 30 lbs, and my son 22 lbs when I started riding them like this. I didn't ever feel like it was too hard for me, except going up an extremely steep hill on the way back from my daughter's school. Even so, I could do it, just not at full speed. And I almost always use the hardest gears, instead of downshifting, because I want to get a really good workout. So, here are some of the downfalls to our plan. My husband's bike won't fit the tyke-toter, because of the bar across the front of it. And it's a pain in the neck to move the infant seat. 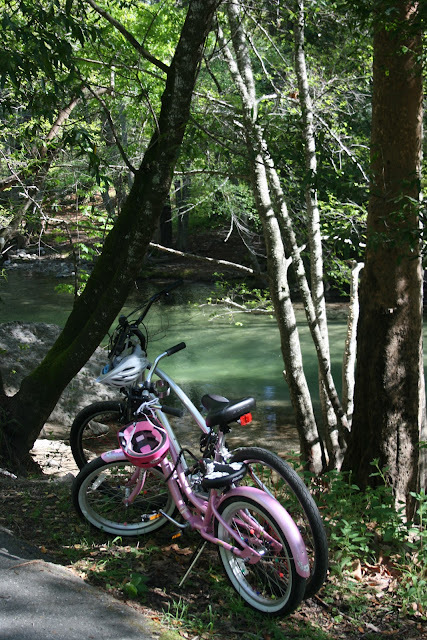 So, on our camping trips, I just ended up biking both kids. Now I love riding with them. It's not at all too heavy, and I have a lot of fun with them. But my husband feels like a "big jerk"(his words, not mine) having me carry both kids, while he rides solo. 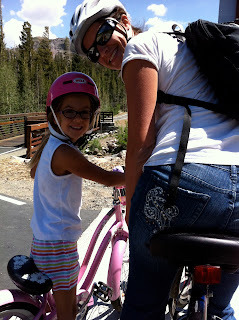 We tend to be a bit of a spectacle when we ride, and people always stop to look at us biking with our little munchkins. Then he says he especially feels like an incredible heel. So sometimes, he'd beg to ride my bike (with both kids) so I wouldn't have the heavier load. But I liked riding my own bike. So it was kind of annoying. Dad on bike with K on tag-along, R on her own bike, L on back of mom's bike. I love this set-up. Having the tyke-toter on my bike, allows me to easily ride K and L whenever I need to (when Dad's at work). Having the tag-along on Dad's bike gives us the freedom to each take a little kiddo as necessary. It works well for all of us. My sweet hubby even brought little K's bike with training wheels so she could practice riding around the campground too. He's a keeper! 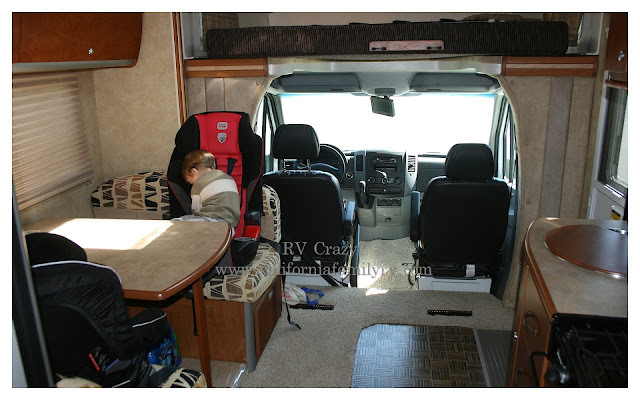 2008 Winnebago View loaded with SportRack bike carrier for four bikes. My husband researched all of our options and selected the SportRack for our bike transport needs. Ok, here's where I admit I was wrong again. As he was installing the rack (it was HOT outside, ok?!) I asked him if he was really sure all of this was worth it. I mean, I never had bikes when I went camping as a kid. Were we really going to use them? I was again forced to eat my own words. Biking has been an amazing addition to our camping experiences so far. Our bikes parked while we explored the giant Redwoods at Big Sur. We were able to bike all through the forest. Much easier to get from place to place with little ones whose legs get tired easily! R & K riding their bikes near our campground in Carpenteria, CA. Daddy & daughter exploring the campgrounds. 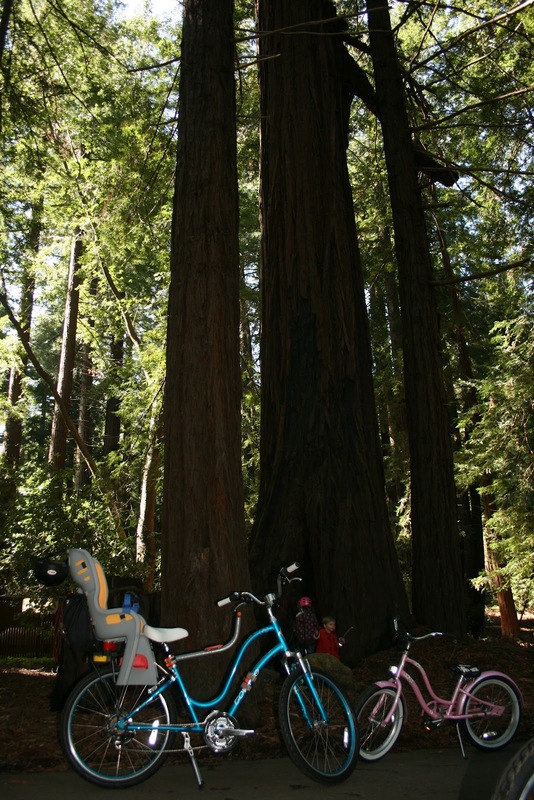 Biking is a great way to find (and take quick pics or notes) of your favorite campground spaces for next time! Mom & daughters about to ride down the huge hill from Twin Lakes to Mammoth Village in Mammoth Lakes, California. So sorry for the huge rear shot. Little K took this picture from her tag-along behind us. Since it's hard to get pics of myself with the kids, I take what I can get. Even if they're not the most...er...flattering. Well, as you can see, I'm a bike convert. I'm sold. I love having the bikes with us. It's been awesome to explore all of the campgrounds we've been to on bike. Our kids love it too. It's also been nice for me to be able to ride our daughter to school and back. Especially nice with gas going up (and above) $4 lately. Yuck!! Who wants to waste money on gas? I'd so much rather spend it on bikes and r.v. equipment. hee hee. hey, was just wondering how you installed your topeak on your electra. I have an electra townie 7d and the topeak wont instal on it... any advise would be greatly appreciated.. did you need a special attachment? Hi Nicole. It was a very tight fit! My husband actually had to do it for me, because I just couldn't muscle it on there. He removed my bike seat first, and took the reflector off the seat of my bike, then put the Topeak seat on. Then, after the child seat was on the bike, he replaced my bike seat. It is very close...the seats touched, but it did fit on there for me. The hard part would be if you were not fairly tall, I don't know how much adjustment you would be able to make. I hope this helps. Good luck and happy riding!! Hi! How did you hang the backpack/bag on the rear of the Topeka bike carrier? I've read that the carrier is incompatible with side panniers and that adding rear storage sticking out from behind or off the front would significantly compromise balance and safety. So, I'm trying to figure out how to rig a small bag for storage of essentials and a few groceries if needed. Thanks! !